I MUST NEED AN INTERPRETER BECAUSE WHEN I SAY HURRY, PUT YO - ProudMummy.com the Web's Community for Mums. 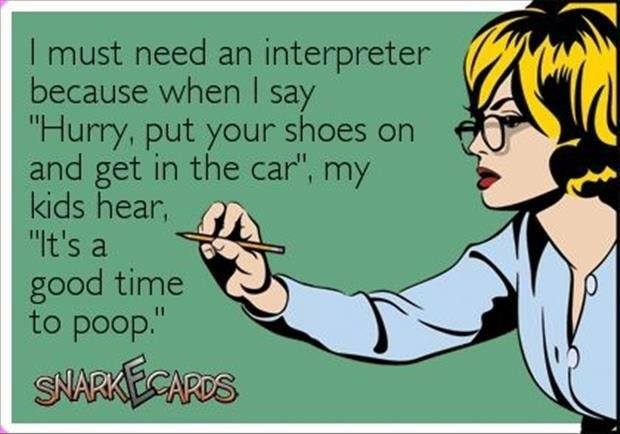 I MUST NEED AN INTERPRETER BECAUSE WHEN I SAY "HURRY, PUT YOUR SHOES ON AND GET IN THE CAR", MY KIDS HEAR, "IT'S A GOOD TIME TO POOP." Josh it’s Ryder every morning..